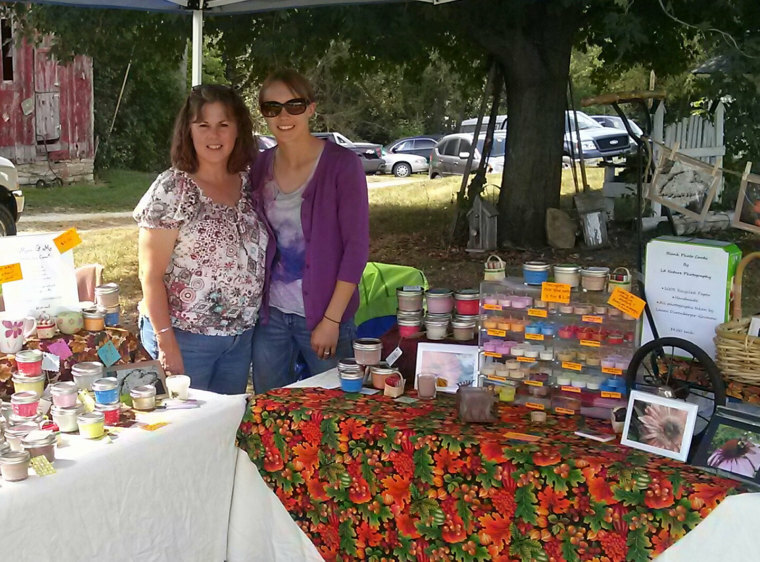 Michelle and Laura are the mother-daughter duo who make up Mom (Michelle) and Me (Laura) Soy Candles. Simply put, we enjoy spending time together working towards a common goal of producing a pleasing, environmentally responsible, and natural (non-petroleum) candle for your enjoyment and ours. We started making candles a few years ago when Mom (Michelle) approached Me (Laura) about a community ed class she saw on making your own homemade soy candles. We signed up for the class, and immediately were hooked. We not only learned about the candle-making process, but the benefits of soy candles, and more importantly, the not-so-great things about conventional ‘paraffin’ based candles (paraffin wax is petroleum based). The environment and living as sustainably as we can has always been an important part of our lives. When we found out the candles we had been burning for years and years were potentially harmful to our health and the environment, we knew we wanted to start making our own regularly. Soy wax is made from soybeans, a renewable resource, and soy wax burns virtually soot free. We also really liked the fact that soy wax can easily be removed from hard surfaces simply with hot, soapy water. Because of this, we found that we could re-use the glass jar the 4 and 8 ounce candles come in for other things after the candle was done burning. We started out making candles for ourselves, and we would give a few as gifts here and there. It turned out that our friends and family members loved our candles as much as we did! We started getting orders, and we would get ‘hints’ from people that they wanted some as gifts. We heard stories from people who had sensitivities to conventional candles who could now enjoy candles again. It was an exciting feeling to know that people got (and continue to get) as much enjoyment out of our product as we did. Eventually, we started selling our candles at art/craft shows and through a couple wholesale retailers, and have had a blast doing it. Scent is a really powerful memory trigger, and many times someone will smell a Lily of the Valley candle, for example, and tell us a story of how their grandmother used to grow the flowers in her garden. They can then take the candle home and be reminded of the good times they had with their grandmother. We also have some fun scents, like Monkey Farts, and enjoy seeing people get a good laugh from smelling it. At the end of the day, as we light one of our Mom and Me Soy Candles, we feel great knowing we are doing what we can to help our environment and to help protect the health of our family and friends.